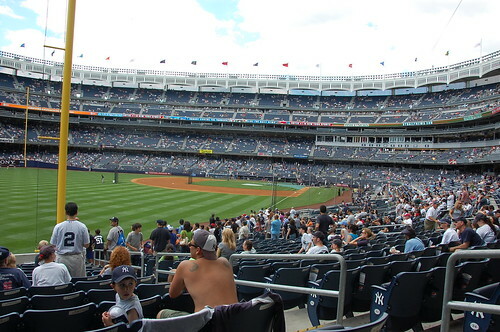 As my significant other constantly reminds me, if the team’s wearing grey uniforms, it’s a road game, even if it takes us less time to get to the stadium in the Bronx than it takes us to get to our own ballpark. 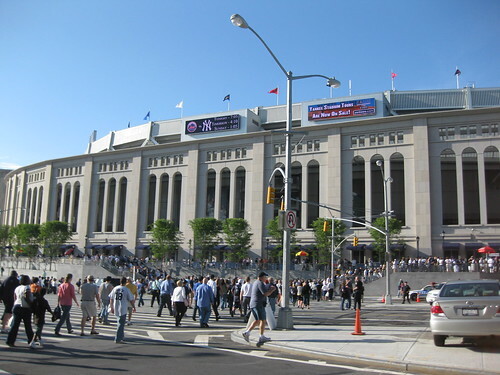 The new Yankee Stadium looks beautiful on the outside. It also looks beautiful when you’re sitting at your seat (for the most part – I will not go into the season ticket holder contretemps because I am not one). 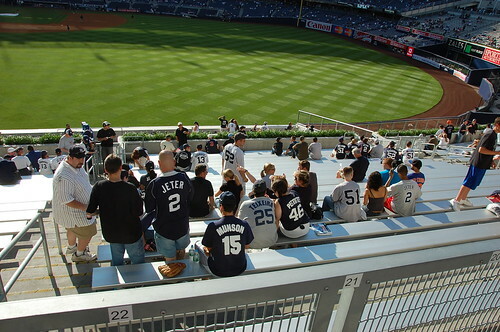 The park accurately reflects the identity of the team. You have zero doubt whatsoever whose stadium you are in. In terms of branding, they nail it. But in terms of creating a fan-friendly experience, in what’s likely not a surprise to most people, they have a long way to go. 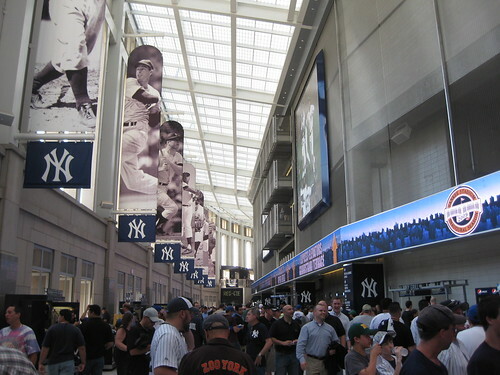 The Great Hall (because, of course, everything the Yankees do is great; it would never just be the Hall) is initially a fine experience, but after a while, it starts to feel like a train station or a bank. (I hear some of the beat writers make jokes about getting to their gate for their flight.) The arches bring in air and sunlight but there is no connection between this space and the playing field. It feels like a futuristic tranit center more than it does a ballpark. Nothing about this space says, “You are here to see baseball”. 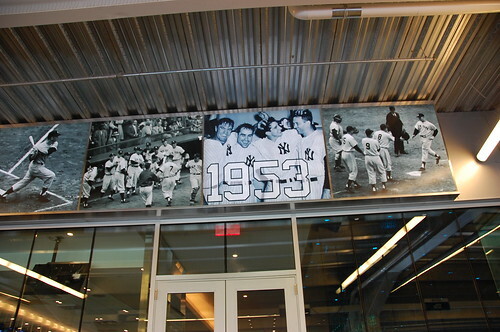 There are signs for the Hard Rock Cafe and NYY Steak (“here, they’re not grill marks, they’re pinstripes”) and sure, there are large banners featuring Hall of Fame players, but it feels more like an entrance to a museum than a ballpark. Entering the ballpark proper and walking around on the field level is a strangely disconnected experience. Aside from the Grand Hall (as you enter from Babe Ruth Plaza – it’s the entrance closest to the subway), the passages are constructed of bland gray concrete cinderblocks with zero warmth and no personality. There are the occasional vendors accompanied by portable stands and plastic signs stuck on the wall. 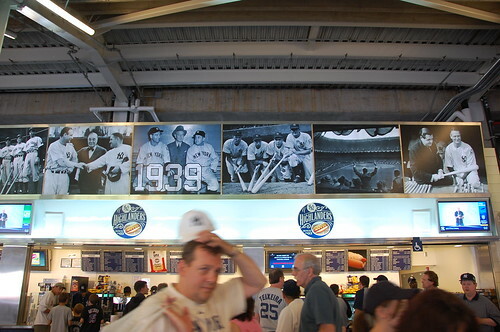 It’s a full 360 concourse, and it seems that you can theoretically stand around on the field level concourse – except behind home plate, where there is a large black curtain that is pulled during the game. Allegedly it’s for wind control, but everyone knows the real reason. I was intimidated enough to not even try to take a photo (and there were a gazillion people walking around anyway, since it was a Saturday and the 4th of July). 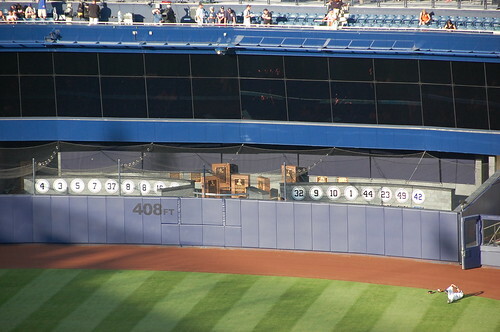 As you walk around the field level, you’ll notice that there are chronological photographic friezes illustrating key moments in Yankee history. This is the kind of thing that we don’t have at Citi Field and it drives me nuts. This wasn’t complicated or expensive to do, but it’s incredibly effective. 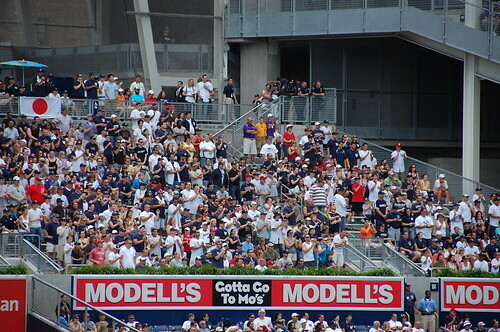 Yankee fans walk around taking photos before the game. It’s simple and easy to understand. It adds a lot. It isn’t hard to do this kind of thing, but what the Yankees understand that the fans don’t is that this stuff is important to the fans. 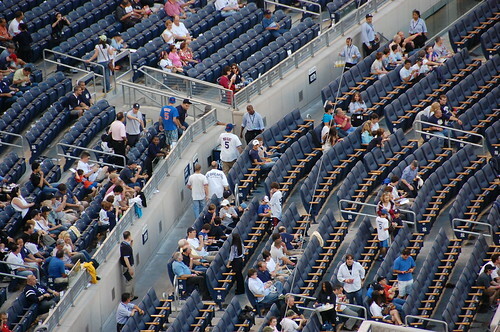 Be sure to walk around the bleachers, no longer disconnected from the rest of the stadium, or from beer. There are still benches and still Bleacher Creatures, but there is Johnny Rockets and a restaurant and a bar hidden in the batter’s eye. The retired numbers are out here too. 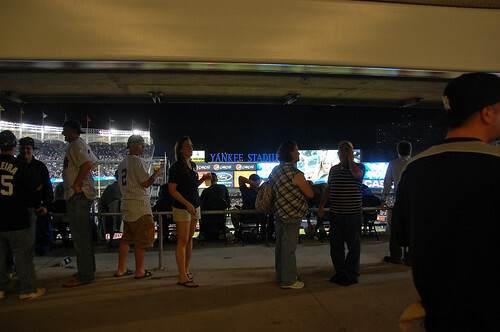 Monument Park is really disconnected from the rest of the stadium now. We’ve been to the original, so there wasn’t much incentive on our part to line up to take a look. 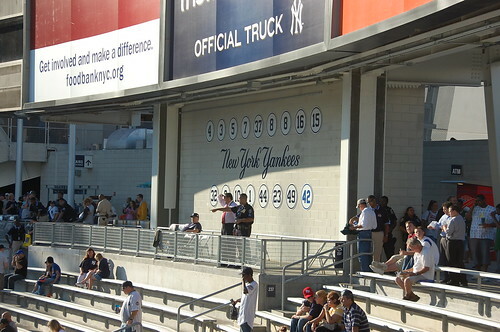 The lines for Monument Park haven’t changed. Get to the ballpark earlier than early if you want to see Monument Park. Earlier than that if it’s on a weekend. The food here is going to be expensive. This should not surprise you. You can bring in your own food if budget is a concern. But if you’re eating in the ballpark, there is standard ballpark fare (hot dogs, sausages, etc. ), but there is also sushi and noodle bowls (think udon) and local bbq and then there is the piece de resistance, the Lobel’s steak sandwich. It’s $15, but it feeds two people easily and is worth $15. 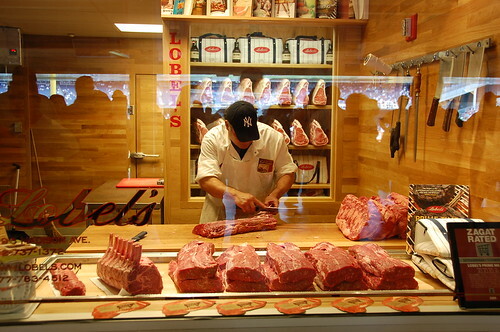 you can only get it in one location in the ballpark, on the field level in left field – at the same location you can buy hundred-dollar packages of specialty meats, packaged in a pin-striped cooler bag. My thought is probably the same as yours: “When I want to spend money on expensive steak, I think, hmm, let’s go shopping at the ballpark… where it will sit in the sun for four hours.”) Even if there’s a line, get in it – they only sell the steak sandwich there (along with drinks) so there’s no hemming and hawing or delay while people decide what they want. If you’re sitting in the affordable seats upstairs, take an elevator or be prepared for a long walk up the ramps, past the various suite levels. When you finally get there, there’s even less personality. The upper level reminded us of Great American Ballpark in Cincinnati. It isn’t a compliment. 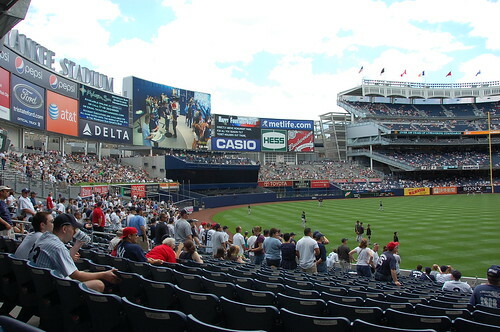 It’s constructed similar to Citi Field in that there are two levels of seating, and you walk up or you walk down, and the concourse is behind and inbetween. This leaves spaces to stand and watch the game, although the views are not great. The new outfield scoreboard is impressive. The main video board is enormous, and the whole area accurately echoes the old low-tech scoreboard across the street. The same annoying announcers are still there to read all the greetings to 7 year old Justin from Middletown at his first Yankee Game, love Mom, Dad and Grandpa Joe. 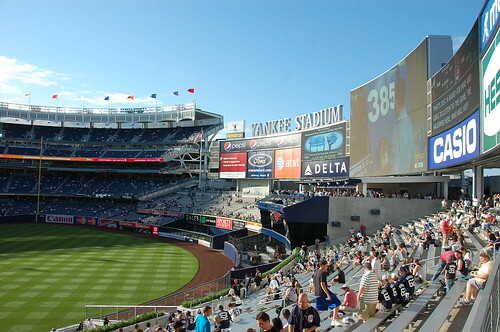 I know Yankees fans feel that they’re getting too many commercial or sponsorship messages, but I found it par for the course for a large city ballpark which has a large video screen. 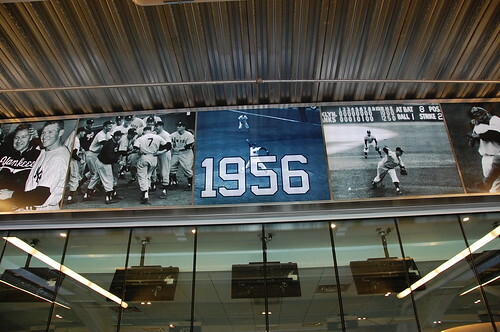 For those fans of Yankeeographies, they are now larger than life. The sound system, however, I found to be adequate. Not excellent, but it gets the job done. Exiting the park was quick and efficient. Multiple exit points, escalators running down, wide passageways all accommodate a large mass of people trying to leave quickly, especially for two Mets fans trying to get the hell out of Dodge after Luis Castillo dropped That Ball. In short, I will take the compromised sightlines of Citi Field over Yankee Stadium III’s glorified sterility any day. So much time and money and effort went into designing this ballpark – but with the largest sums of money being directed at the smallest groups of fans. The kid sitting in the bleachers today could be the corporate executive wanting to buy a box tomorrow. 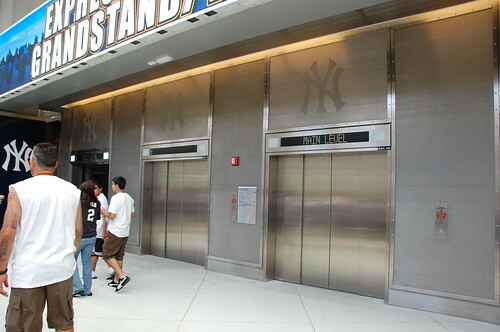 Maybe this is what the Yankees consider aspirational? I don’t know. 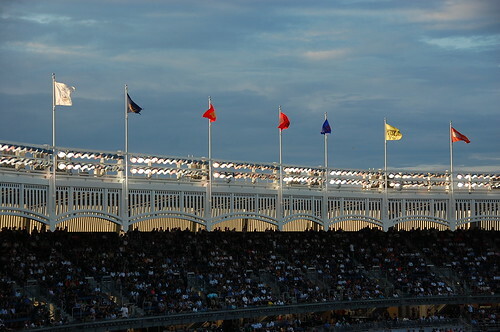 You still can’t bring a bag into Yankee Stadium unless it’s a clear plastic bag. In the past they used to hand those out, I’ve been twice now and have not seen anyone offering them. We did get our water in in a regular plastic bodega bag, and I saw some guys get in with shopping bags from various stores (but were sent to the bowling alley to check their backpack). Women can still bring a purse. You *can* bring food into the ballpark. You can bring water as long as it’s in a sealed bottle. No limitation on quantity and size. Getting tickets: the secondary market is going to be your best friend. As always, I recommend eBay over Stubhub. If you’re local, try Craigslist. If you’re dealing with a season ticket holder that just wants to dump their tickets for the game and will meet you in person, it’s very low risk. Avoid the scalpers at all costs. Parking has gotten more expensive. There is a new Metro-North stop for the suburban fans. But the 4, B and D train still stop at 161st Street like they always have. The steak sandwich is available near Section 139 on the field level, close to the foul pole. Make sure you ALWAYS have your ticket with you, especially if you are wearing the opposing team’s colors. Even sitting 5 rows from the top we had to produce the ticket every single time. When we were there in July and not wearing anything related to a team, my 7 year nephew also had to constantly produce his ticket, it wasn’t enough that his father had a ticket. The security definitely reinforces the us-vs-them feeling at all times.